Since 2009 we are working together with a view smalescale farmers in Tansania and several times we went for Permacuture Consultation and Trainings to Kenia. Our luck is, that we are also no nativspeakers in english, a nother point is, that Austria had never Colonies and that we run just on a little budget. Through the years we found faithfull partners and friends. We are working very close with ANAMED Tanzania, we always try to implement Natural Medicin in our Trainings and Dr. Peter Feleshi, chairman of ANAMED Tanzania does allway add Permaculture into his ANAMED Trainings. In 2010 we did the first Permaculture-Designzertificat-Course in Umbwe Onana, in the Region of Moshi. We had the chance to do this at Aloyce Massawes farm, he is the most famouse beekeeper in east Africa and also a very smart farmer. He becames famouse in his reserch of the stingless honeybees. Already in this time we started to work together with Sebastian Lugheti from the Machita Region at Lake Victoria. We visited him several times and conducted also some Permaculture-Training at his village. Specially the last years the did big achievements. For example, at a training in Jannuary of 2017 we dug by hand a 25 meter long and a 3 meter wide Chinampa in the wetland of the shore. This one Chinampa was multiplyed by the owner into 10 Chinampas. Now his hole land looks like edible food forest. On the raised hills he is growing the fruittrees, shuggercan, arrowroot and others. In the ponds between he is raising fish and growing Azola fern on the surface. In 2017 we invited Dr. Peter Felshi to Austria, to give some lectures in Tropical Natural Medicine. In this time we started also writing on the "Kitabu cha Permaculture". After nearly 2 years tough work we could give the book to the publisher. We let print the book at Inland Press / Mwanza / Tanzania. It was the first collerdprinted book for them. But finaly we did it! 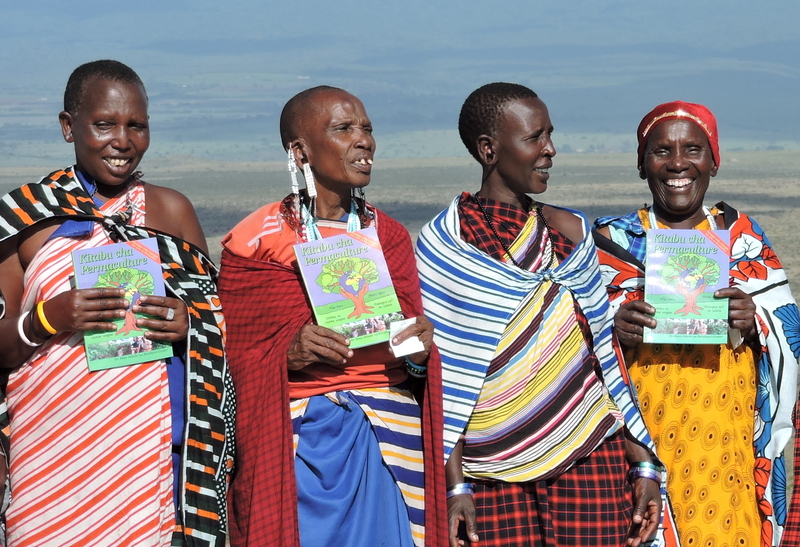 Now it is on the Market - the first printed Permaculture Book in Kiswahili! It got a collourfull picturebook with a lot of usefull things and offcourse the ethics, principles and methods of Permaculture included!